GLENDALE — Valley soccer fans showed once again that their passion for the world’s most popular sport is alive and well. More than 37,000 crowded into University of Phoenix Stadium for two Gold Cup quarterfinal matches last week, marking the third time in as many summers the Valley has successfully hosted a major international soccer tournament. Phoenix Rising FC, Arizona’s highest level professional soccer team, hopes that Major League Soccer takes notice. 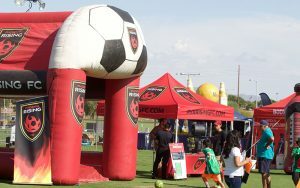 “Events like the Gold Cup and Copa America last year really indicate how passionate people here in the Valley are for soccer and how they’ll come out to watch soccer,” Phoenix Rising spokesman H. José Bosch said. 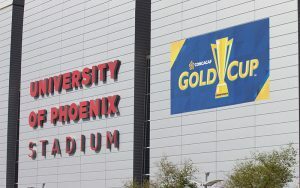 In 2015, University of Phoenix Stadium hosted the Gold Cup, which crowns the continental champion of North America, Central America and the Caribbean. Last summer, it drew more than 60,000 fans for a match between Mexico and Uruguay in Copa America Centenario, the 100-year anniversary of South America’s premier international tournament. Phoenix’s recent history of hosting high-profile international soccer matches has given Phoenix Rising confidence that the Valley is ready to have a team in MLS, America’s top level of professional soccer. After placing a bid for an MLS expansion franchise in January, the club has been trying to prove that Phoenix should be one of two new cities that will join the league in 2020. MLS commissioner Don Garber is expected to make a final decision on expansion sometime this year. Phoenix Rising already has built a temporary 6,200-seat soccer-specific stadium on that site and sold it out all but one of its eight United Soccer League home games so far this season. The club, which features high-profile stars like Didier Drogba, Shaun Wright-Phillips and Omar Bravo, plans to build a bigger venue if the MLS comes calling. Rising officials hope that those factors, along with Phoenix’s large Hispanic and millennial populations, will convince the MLS that it’s finally time to award a franchise to the largest city in the United States that doesn’t currently have one. Nearly 30 percent of the Phoenix Metropolitan area’s 4.2 million population was Hispanic as of the 2010 Census Bureau. Sanchez, a long-time soccer fan, is no stranger to the Phoenix Rising Soccer Complex as his two siblings are season-ticket holders. Phoenix Rising has focused on building its brand and growing its fan base, which made the opportunity to work with the Gold Cup too good to pass up. Bosch said the team worked with Soccer United Marketing (SUM), the leading integrated marketing partnership company for MLS, the Gold Cup and the U.S. Soccer Federation. SUM works with local professional teams in cities that host the event to build awareness for the tournament. That partnership turned out to be mutually beneficial for Phoenix Rising, which helped host a pregame “Football Fiesta” at University of Phoenix Stadium, exposing the club to international soccer fans gathering for the games. Bosch believes that the strong showing of support at the Gold Cup is just another sign that Phoenix is more than capable of supporting an MLS team. “We’ve told everyone that will listen how great of a market Phoenix is for Major League Soccer and we can point at all different levels, ” Bosch said. After drawing crowds of more than 60,000 people to matches at the 2015 Gold Cup and last summer’s Copa America Centenario, the attendance of 37,000 plus for this year’s Gold Cup might seem underwhelming, but the smaller crowd can be attributed to the decreased importance of this year’s tournament. In 2015, the Gold Cup winner earned an automatic invite to the Confederations Cup, an eight-team World Cup warm-up that features the host nation, the previous World Cup winner and each continent’s reigning champion. This year’s Gold Cup winner will be recognized as the top team in North America, Central America and the Caribbean, but will not earn any additional honors or guaranteed tournament invites. The United States takes on Jamaica in the championship Wednesday at Levi’s Stadium in Santa Clara, California. The lack of incentive and less star power in this year’s tournament didn’t stop some dedicated fans like Juan Rodriguez from coming out to support his team. Rodriguez drove six hours from El Paso to Glendale to support Mexico in its match against Honduras. He was impressed with the atmosphere around the venue, especially given the absence of Mexico’s all-time leading goal scorer, Chicharito Hernández, among others top players.